One of the common problems with invasive weeds is identifying them. There are countless tales of people blithely strimming back a stand of knotweed and spreading it because they didn’t recognise what they were dealing with. Hopefully this has become less common in recent years due to increased publicity and awareness of invasive species issues but it does still happen. Once you know what you’re looking for you’ll spot Japanese Knotweed everywhere you look and Giant Hogweed, as the name suggests, grows large enough that it’s difficult to miss. A word of advice though, you don’t have to mention it every time you spot some, your friends and family will begin to mock you. But what if the plant doesn’t look like it’s expected to? Various things can affect the growth and development of plants, limited light, limited water supply, limited nutrients or phytotoxic contaminants in the soil and as in this case treatment with a herbicide. This is particularly important with Japanese Knotweed which will require a course of treatments over several years so you can expect to encounter these effects. The picture above shows a stand of Japanese Knotweed which has previously been treated with a glyphosate based herbicide. As a result of this when regrowth which has occurred the entire stand is smaller and less vigorous than previously. 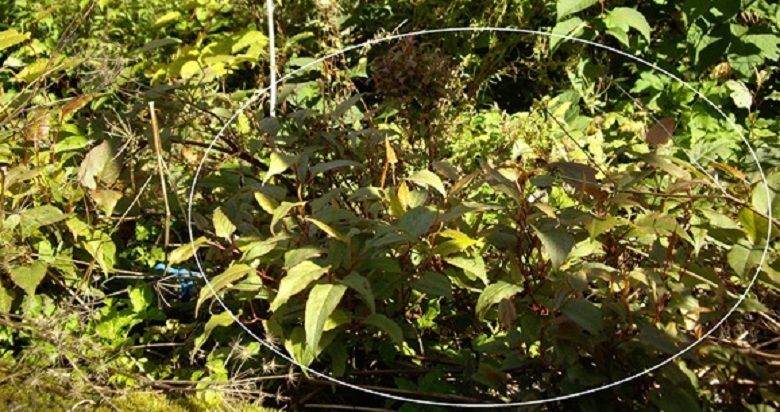 Despite being smaller and somewhat distorted most of the plant is recognisable as knotweed, however the circled plant in the central foreground of this photo does look distinctly different. This is what is termed as Bonsai Knotweed because of the miniaturised and twisted appearance of the plant. If there was only bonsai knotweed present on the site it would be rather easy to mis-identify it as something less troublesome. The knock on effects of such a failure to identify knotweed could be costly and may even lead to breaches of the law. On the plus side this form of growth for knotweed is distinctive of a stand which has regrown after treatment so it’s likely that the course of treatment will be scheduled to continue. But if in doubt, particularly if you’re intending to develop the area where this plant is growing, it’s wise to contact a professional to have a look. Developing on knotweed is easily one of the worst things that can happen for you. While knotweed doesn’t tend to grow into foundations when it has other places to spread to, if you build on top of it, it will grow straight through them, that’s when it’s at it most damaging. 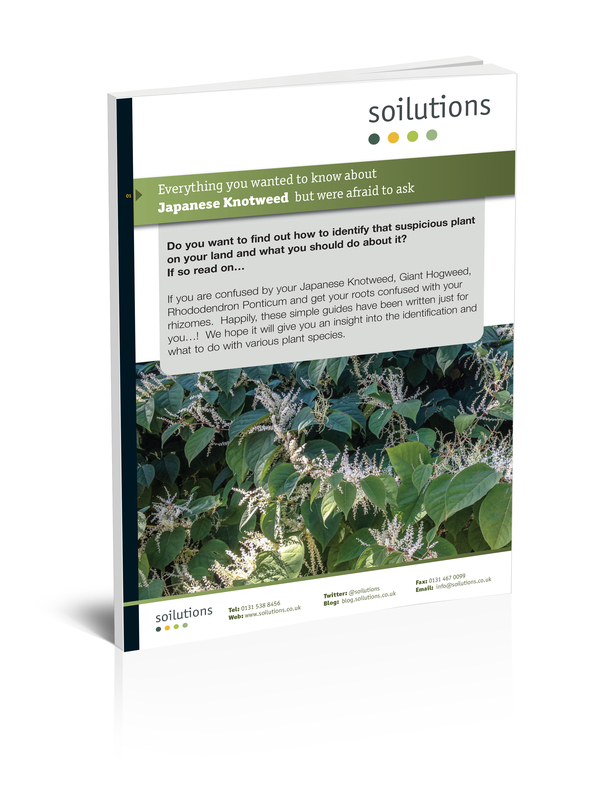 Your text highlights the importance of employing specialists that know what they are looking for and how best to control and eliminate knotweed from affected land. I am sorry to disagreed, but knotweed does not grow straight through concrete. Elcot Environmental have been removing knotweed from around buildings to be demolished in many parts of the UK for over 14 years. We have never found knotweed growing through concrete of structurally sound brickwork. It will and does grow through voids, such as service runs, expansion joints and fractures. How could the the use of root barrier membranes-most of which you can puncture with a garden fork or road pin- hold back something that ,it is claimed, can grow through concrete? The comment above is correct, it’s a common mis-conception that Japanese Knotweed will grow through a solid concrete slab. The myth comes about because of well publicised photos of Knotweed sprouting through the floor of people’s living rooms. It will exploit and widen cracks in concrete and damaged or degraded mortar in brick structures. Unfortunately it sells more newspapers and brings in a wider audience to your tv segment if you sensationalise the more remarkable aspects of the plants growth so these myths are perpetuated.